I have requested that the Green Scorpions take steps against the municipality for allowing this environmental health situation to reach disastrous levels. Hopefully, this will draw their attention to the seriousness of the health risk that this situation poses to the community, workers, the environment and SANparks. SANparks which is across the road from the waste transfer site is at this stage also littered with rubbish from the waste transfer site. 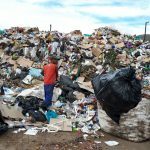 Reports and pleas to the Dr Beyers Naude Municipality have fallen on deaf ears. No attempts are being made by the municipality to clean the site and implement proper control and supervision mechanisms. The Democratic Alliance believes that every person has the right to live in a clean and safe environment where good governance exists to create such conditions. Service delivery must be sped up in poorly run municipalities such as Dr Beyers Naude Municipality.